In these Terms and Conditions “you” or “your” means the person ordering a Product or Products detailed on our Website; and “we”, “us” or “our” means hearear.co.uk a trading name of Hear Ear Audiology Limited. “We” or “us” means, please note, that when arranging delivery of your Order, we may instruct a third party courier or postal carrier to deliver it to you. However, we will ultimately be responsible for managing the delivery of your Order, so for the purposes of these Terms and Conditions, all references to “we” or “us”, will be taken to include such third parties. By using the hearear.co.uk website you agree to be bound by these Terms and Conditions and any Orders placed by you are bound by these Terms and Conditions. If you do not agree to these Terms and Conditions, please do not use the Website. All text, graphics, photographs, logos, trademarks, artwork, sounds, music, user interfaces, visual interfaces and computer code (the “Content”) belongs to us. This Content includes, but is not limited to, the design, structure, selection, coordination, expression “look and feel” arrangement of it. The Content is protected by trademark and other intellectual property rights and you are not permitted to copy, reproduce, republish, upload, post, publicly display, translate, transmit or distribute this Content in any way without our prior written permission. Any Order you place with us is an offer from you to buy products. We accept that offer when we receive your payment not before. Title of ownership of the goods will transfer when full payment has been received by us. If we cannot provide the products you Order, we will give you the option to cancel your Order or place an alternative Order. If necessary we may cancel your Order, or you may cancel it before we have sent the products to you, see Cancellations. We may substitute or change the exact details of products from time to time. Once again, we will try and tell you about changes that affect your Order before we send the products to you. However, if we send the products to you, you can return them to us under our 28-day Money-back Guarantee. Prices shown are in pounds (£) sterling and are inclusive of postage and packing and UK value added tax (“VAT”) where applicable, at the appropriate rate, and are correct at the time that the Product Description was first entered onto the Website. Prices of Products may change from time to time and any promotional discounts or offers may also be withdrawn at any time. Although we try to ensure all our Product’s prices displayed in the Product Description are accurate, errors may sometimes occur. If we discover an error in the price of a Product you have ordered we will be unable to accept your Order and shall contact you as soon as possible in order to give the option of either reconfirming your Order at the correct price or cancelling it. If we are unable to contact you, we will treat your Order in respect of the incorrectly priced item as cancelled. 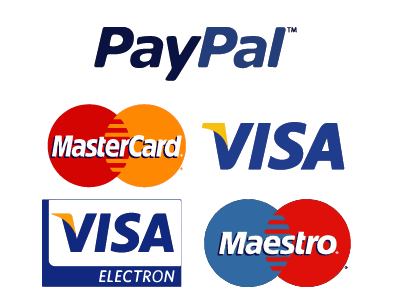 You can pay for your products using any one of the payment methods detailed on our website. When paying by credit card, debit card or Paypal, the person placing the Order must be the credit card, debit card or Paypal account holder or have the credit card, debit card or Paypal account holder’s authorisation. If the credit card, debit card or Paypal account holder later denies authorisation, you may be charged with a criminal offence. If you choose to pay for your Order using a payment card with a foreign currency denominated account, the account will still be taken in pounds (£) sterling at the foreign exchange rate applied by your relevant credit card provider or bank at the time of processing your Order. Your international credit card provider or bank will determine the exchange rate and may add an additional processing or administration charge which you will be liable to pay. Your card or Paypal account will be debited at the time of placing your Order and will show on your bank statement as Paypal. Refunds will be issued back to the credit, debit card or Paypal account which you used to place your Order. Where you have requested delivery of your Order to an EU country, the total cost of your Order will include UK VAT. Where you have requested delivery of your Order to a non-EU country, the total cost of your Order will not include UK VAT. However, it will include any taxes, duties, fees, levies or other charges levied by that non-EU country, which will be added to your Order at checkout and paid on your behalf by us to the relevant local customs authorities. You will be the importer for the international delivery of your Order (i.e .any Order delivered to a country other than the UK.) Therefore, before placing an Order, it is your responsibility to check that the Products you are planning to import comply with state and federal government import regulations, and that there are no local requirements or restrictions which may affect receipt of your Order. If any customs requirements apply or charges are due, you agree to be responsible for these. Prices of the products are for deliveries within the UK. Costs for delivery outside of UK can be arranged at an extra cost, see Contact Us. It is your responsibility to ensure someone will be at home (or work) to accept delivery. Items sent by courier must be signed for. If you are not at home the courier will leave a card and you will need to contact the courier to arrange a different date. If we have not tried to deliver within 14 days of you placing your Order, you may cancel and receive a full refund. If you do not receive your products within 10 days of the date of invoice we send to you, tell us immediately and no later than 20 days after the date of the invoice, otherwise we will assume that the delivery has been made. We will always deliver products to you or contact you at the address you have given us, unless you tell us otherwise. If the products you receive are damaged in transit you must contact us within seven days of receiving the products. We will send a replacement Order but you must return the damaged products, together with all the packaging for us to inspect. We will refund the postage and packaging costs of you returning the products. As long as you meet the conditions set out in this clause, and the products you return prove to be of poor design or manufacture, we will replace these products. If a delivery is short, you must contact us within seven days of receiving the Order. Please remember that we will not be able to make good any shortage, damage or fault if you fail to notify us as specified. If you are an EU customer, you have the right to cancel your contract at any time up to fourteen (14) days after the day on which you receive your Order. If, for any reason, you wish to cancel your contract before your Order has been dispatched then you need to let us know by emailing or telephoning. Once we have received notification by you of your wish to cancel your contract, subject to any monies having been taken from you, we will refund you the original purchase price and delivery charge of your Order within fourteen (14) days. As it is our policy to try to process your Order immediately it may not always be possible to stop an Order from being despatched. If you decide to cancel your contract and your Order has already been despatched, then you need to let us know within fourteen (14) days after the day on which you receive your Order. You can notify us by using one of the options identified above. Once we have received notification by you of your wish to cancel your contract, you then have a further fourteen (14) days to return your Order to us. You will be given a full refund as long as we receive the cancellation notice before the goods are despatched, or after the product is received back from you (less delivery costs). We will not reimburse return postage costs. Clause 7 also applies if you want to cancel an Order. All returns must be sent with customer identifiable information such as the despatch note originally enclosed with your Order. If you do not supply this information, we may not be able to process your return quickly or at all. See Clause 8. We cannot be held responsible for any products you return until we receive them. We recommend you get proof of postage that you have posted the products to us. We try our best to make sure that we process returns within 10 working days Mon-Fridays of receiving them. Please remember that products returned using Royal Mail can take up to 14 days to reach us. If you are a Non-EU customer, then these legal rights do not apply to you. In the event that you do not wish to keep your Order, you need to send this back to us within fourteen (14) days after the day on which you receive your Order. For more information on how to do this, please see our Returns and Returns Policy. Within fourteen (14) days of us receiving your Order back by post, or receiving proof from you that your Order was returned to us, we will refund you the original purchase price and delivery charge for your Order, provided that you return the Product(s) to us in a saleable condition. The refund of your Order’s original purchase price will be refunded automatically. Refunds will be issued back to the credit or debit card which you used to place your Order. This will appear in your account within five (5) days depending on your card issuer. If you originally paid for your Order using your Paypal account then your refund will be made back to your Paypal account. We have a 28 day money-back guarantee. We will only accept returns of products which the guarantee applies to if you return them in their original packaging with any instructions sheets and in an “as new” condition. We will then exchange the products or give you a refund (less postage and packing charges). The guarantee does not apply if you have used the products (or if you have used the products incorrectly), other than to assess whether they are satisfactory. We warrant that when all the products are delivered they will match their description, be free from faults and fit for purpose for at least 12 months (unless otherwise specified when delivered). The warranty does not cover faults due to fair wear and tear, deliberate damage, negligence, abnormal working conditions, you not following the manufacturer’s instructions (whether spoken or in writing), misuse or the products being altered or repaired without our permission. If you return products without customer identifiable information or any other form of proof of ownership, we may not be able to identify you as the owner and so may not be able to accept the returns or send the products back to you. If so, we will store the products for 28 days, after which (if they are not claimed) you authorise us to safely dispose of them on your behalf. You will become responsible for what happens to products as soon as you have received them. You will not become the legal owner of products until you have paid for them in full. If you have not paid for products, we may refuse to accept further Orders from you and we may take legal action against you. Which arise out of or in connection with us selling you any products. Any liability we do have will be limited to the price of the products. The exclusions of liability set out in these Terms and Conditions shall not apply to any damages arising from death or personal injury caused by our negligence, or any of our employees or agents. The contract between you and us will be concluded in English and subject to the Governing Laws of England and the Jurisdiction of the English courts. If any provision of these Terms and Conditions shall be unlawful, void or for any reason unenforceable then that provision shall be deemed severable and shall not affect the validity and enforceability of the remaining provisions. Ordering online using your credit card, debit card or Paypal details is just as safe as ordering goods over the phone, if not more so. We have been issued with a secure server certificate and all payment transactions are securely handled by a leading independent payment processor and are not stored on our Website. If we are unable to perform our obligations to you (or only able to perform them only at an unreasonable cost) because of circumstances beyond our control, we may cancel or suspend any of our obligations to you, without liability. Examples of those circumstances include act of God, accident, explosion, war, terrorism, fire, flood, transport delays, strikes, and any other industrial disputes, and difficulty in obtaining supplies. Any contract between us, whether for use of the Website or in relation to the purchase of products through the Website will be governed by the laws of England and Wales and all parties submit to the non-exclusive jurisdiction of the English Courts. If any part of these Terms and Conditions is not valid or cannot be enforced in whole or in part this will not affect any other part of the Terms and Conditions. We can transfer, assign, novate or subcontract all or some of our rights and responsibilities under these Terms and Conditions to any other organisation. We reserve the right to amend, remove or vary the Website, any page of the Website, any content of the Website, or any service offered on the Website at any time and without notice. Any person other than you and us has no rights under the Contracts (Rights of Third Parties) Act 1999. “Personal Information” means details you provide to us when you use the Website, such as your name, e-mail address, billing address, delivery address, telephone number, Product selection, credit card or other payment information and a password. “Product Description” means that part of the Website where certain terms and conditions in respect of the individual Product are provided which shall include, but not be limited to, all details, prices (cost of the Product and delivery charges), photographic representations and descriptions of a Product. It shall also include, where appropriate, specific delivery dates and times, warranties, aftersales service and guarantees about that Product. “Website” means the website located at www. co.uk or any subsequent URL which may replace it. “UK” means, for the purpose of these Terms and Conditions, England, Wales, Scotland and Northern Ireland.